Photo: Shichihonyari junmai. 60% seimaibuai. Et-chan and Te-chan at Tokyofoodcast were raving so much about the Shichihonyari 80% nama genshu that my fingers scrambled blindly to the Sakaya Web site to find some. 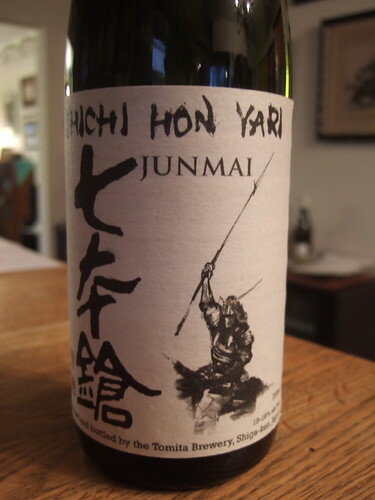 I couldn’t get the nama genshu, so I bought the 60% junmai. I had intended a multi-day tasting report, allowing the sake to change as it breathed and opened and to try it at different temperatures. Instead the “Seven Spearmen” went down oh-so-easy, tasting of clean fruit and smoky nuttiness, one of those multi-sensory sakes that make you keep sipping to see what else you can find. It was very balanced, not too much smokiness, not too much alcohol bite, a generous mouthfeel without being cloying, a clean and solid sake that is quaffable. I’d like to say more, but it disappeared too quickly. Keep in mind that at 60% seimaibuai, the brewer could have called this a junmai ginjo. I don’t know why he didn’t, but I do know brewers sometimes reserve the “ginjo” name for a particular flagship brew, even if their junmai meets the standard for ginjo. —Of course, our venerable Sake Daddy, John Gauntner, has a chapter about Tomita-san and the brewery in his e-book, Sake’s Hidden Stories. —Urbansake.com writes about visiting the brewery. —The Japanese Food Report also has some info about the rice that they use for this sake, Tamazakae. I know what you mean about those intended careful explorations of a bottle of sake over time and maybe even paired with a couple of different meals, but then…. all of a sudden… the bottle is empty.